Ringo Roadagain is introduced during the 4th Stage of the Steel Ball Run. He traps Gyro, Johnny, and Hot Pants near a cabin located in a forest. Ringo challenges Johnny to kill him, and claims it's the only way to escape. 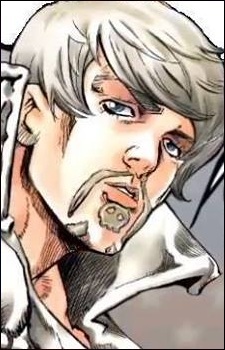 Once Johnny and Hot Pants are bested, he permits Gyro to leave, or enter the "True Man's World." His stand is Mandom. The stand can reverse six seconds of time by turning his wristwatch back six seconds.